UPDATED: Wed., Feb. 27, 2019, 12:18 p.m.
CUCUTA, Colombia – Next year in Caracas? As Venezuela’s opposition rekindles street protests and builds powerful international support, the millions who fled are redirecting their gaze toward their beloved homeland in hopes that their exile will prove short-lived. “I don’t know how it’s going to happen, but next Christmas will be in Venezuela,” Becerra said. The high expectations of an exile community that is over 3 million strong are fueling a renewed push from abroad to bring about change in Venezuela. Some like Becerra are tempted to return already, wanting to join in protests. Others, like exiled lawmaker Gaby Arellano, are playing a key role in collecting humanitarian aid. Even many who left long ago and cannot see themselves returning have begun imagining how they might contribute to Venezuela’s recovery. “I want to put in my little grain of sand,” said Pedro Morales, a gastroenterologist who has lived in Miami for over two decades. And yet even as Venezuelans like Becerra daydream of spending next Christmas back home with relatives they haven’t seen in years, they are also steeling themselves for the possibility that Nicolas Maduro will manage to keep his grip on power. One month after opposition leader Juan Guaido declared himself Venezuela’s interim president, the military has shown little sign that it plans to revolt against Maduro. Like the exile group they most resemble – Cubans– Venezuelans are all too aware that their current status as emigres could become a permanent condition. Cubans for decades toasted to “Next year in Cuba,” a cry that is uttered less and less as their exile from the communist island drags into its 60th year. Each time Becerra gets the urge to pack her bags, she talks herself out of it. Her daughter and mother, a cancer patient, are comfortable in Colombia. An opposition activist, she wonders if pro-Maduro compatriots might still hold a grudge against her. In her mind, she questions if she’d even be returning to the same country. 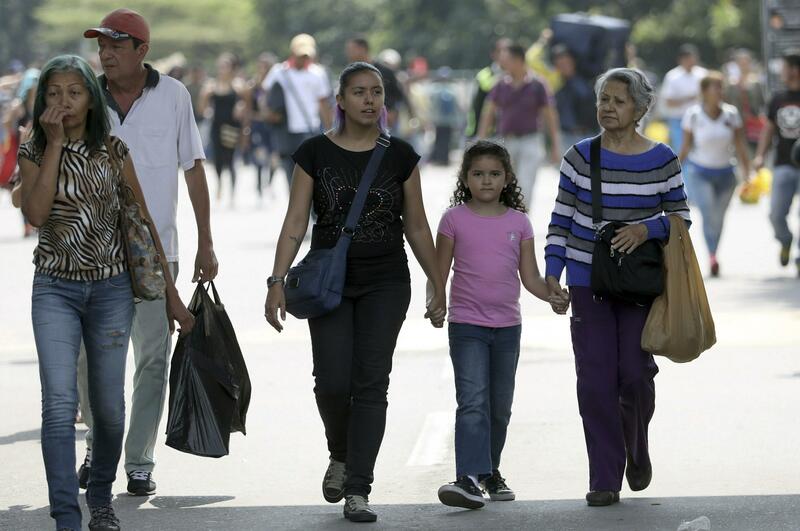 The exodus of Venezuelans is now one of the largest mass migrations in the world – an estimated 5,000 cross into Colombia every day, about the same size as the entire migrant caravan from Central America to the U.S. last fall. The United Nations estimates there are 3.4 million Venezuelans abroad, a conservative assessment based on government figures, though the actual number could be as high as 5.5 million. “There is a lot of international know-how waiting outside Venezuela,” said Daniel Lansberg-Rodriguez, a Venezuela expert who teaches at Northwestern University. Past experience shows that once a Latin American emigre has been abroad for more than five years, they are very unlikely to return, said Manuel Orozco, director of the Migration, Remittances and Development Program at The Inter-American Dialogue in Washington. “The diaspora think they can just come and redo the country in a short period of time – it’s just not going to be that way,” he said. Frank Carreno, an actor and businessman, said that after 15 years in Miami, where his immediate family is now all located, he wouldn’t move back. But he would like to open a business in Venezuela as he did 10 years ago when he set up three vocal training studios. He closed them in 2013 as the country’s economic crisis began to sink in. Others, like Gabriela Alvarez, 32, who has lived in Madrid for the last two years, envision themselves returning but want more than just political change. She said she’d want Venezuela’s crime rate– among the highest in the world – to improve and to be assured that she and her family could get adequate medical care. Venezuelans abroad are already playing a key role in helping Guaido consolidate his position as the country’s interim president. In the years leading up to his proclamation in January, dozens of opposition leaders fled under the threat of arrest. They used their platform outside Venezuela to raise awareness with international leaders and are now helping execute Guaido’s mandates, like findings ways to gather humanitarian aid. “Exile feels isolating, but we’ve been able to reinvent ourselves,” said exiled lawmaker turned activist Arellano. A trained occupational therapist, in exile Becerra has done everything from dog walking to selling corn pastries at the Simon Bolivar International Bridge where masses of Venezuelans enter each day. She says her biggest wish is for her family to spend Christmas together again, gathered like they used to at her grandmother’s house. But she knows it’s more complicated than that: Would she be able to earn a living and provide for her daughter? Could she just abandon the life she has built in Colombia after three painstaking years? Published: Feb. 27, 2019, 12:17 p.m. Updated: Feb. 27, 2019, 12:18 p.m.